Hey, Hey, We’re Mage 20! Sorry this Monday Meeting Notes blog is a couple of days late, but a couple of things ate up my time. 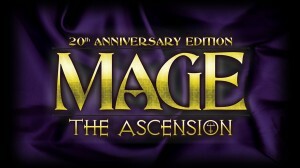 First, we’re doing this little Deluxe Mage: The Ascension 20th Anniversary Edition Kickstarter. And by little, I mean that it funded in 44 minutes, and after two whole days we are at 1775 backers and $270,857 of funding, and have passed 9 Stretch Goals. Then, on Tuesday, I was surprised to discover that the Gen Con administration decided exhibitors this year needed to do their hotel booking at noon. The last we had heard, it was going to happen on the 10th, I think. So schedules were rearranged and at 11:59 I dialed the number they gave us (rather than try to book online which I had heard was problematic). Sometime around 12:12, I reached an operator who was very nice, helpful, and efficient. By 12:35 I had reserved 3 rooms in one hotel and 3 in another. So all in all, not the worst experience, although having to stick the Onyx gang in different hotels is likely to be a little annoying. This was the first time I ever set up the hotels for us, so I really don’t have anything to compare it to, but it does feel good to know that this first Gen Con where Onyx Path has our own booth, and we’re making our own arrangements, is starting to come together. Somehow, it’s another milestone in our development as a publishing company. Back on Monday, Eddy and I talked a lot about the Mage 20th KS, as I wanted him, as our CCP liaison, to be ready for fast approvals and the general direction we were going with the KS. Eddy points out that he is a walking cliche of a Virtual Adept (I added that’s because he has built-in tech in his ears). It was also necessary to discuss something that has come up a few times now that Onyx hosts the WW forums, and that is banning posters. As the caretakers of CCP’s IPs, I think it is important to be sure that Onyx Path is relating to our shared fan-base in a way that works for CCP and the way we need to have things here. For example, I think we learn a lot more about how our projects are actually being received and used when we create an environment that encourages fans to post what they really think and feel about a product, even if they hate it. We need to hear that, and a lot of times a “negative review” reveals issues that none of us caught because we liked the book. But, and here is the point where I have to get all serious for a minute, insulting the creators or Onyx Path is just not the way to be heard. And, in fact, that’s how to get banned. I know how hard I work keeping this whole thing going and building it one step at a time, and I’ve got a pretty good idea how tough it is to develop, or write, or illustrate, or design, these amazing books we’ve put out since 1/1/2012 to the quality level our creators have achieved- as freelancers. So insults, or even worse, threats, are just not acceptable here. Criticize away! Please, as we want and need your input, but no need for attacks. – Exalted 3rd Edition: From Holden: This week we’re continuing to grind away on Bureaucracy, collating and finishing up the final details on Traits, and getting some work done on Evocations. Final draft of Storytelling is being reviewed before being sent to editing. Zub’s EX3 Comic is more than halfway finished being illustrated and both EX3 novels are being worked on (I talked to both novelists last week). Starting to get one of the EX3 Music Suites to a finished state, the Dragon Blooded theme. – V20 Anarchs Unbound – Waiting for Amazon Payments to finish this week and then some fun for our AU backers including first shot at AU t-shirts featuring Smilin’ Jack himself. 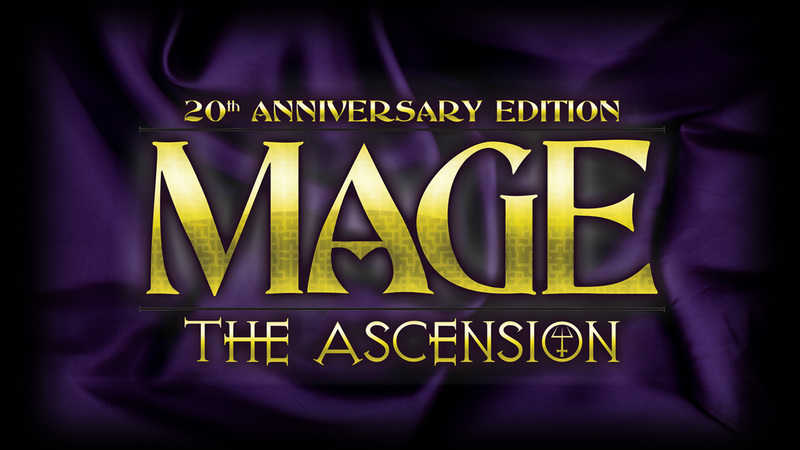 – Mage the Ascension 20th Anniversary Edition- the Deluxe M20 Kickstarter KS went live two days ago and funded as noted above! Going to be some fun Stretch Goals and cool reveals of the text and art as this KS continues for the next 27 days. – W20 Changing Breeds PDF and PoD versions are on sale at DTRPG! Deluxe files are with the printer- proofs were shown to backers and are back with the printer. The cover emboss needed a tweak and new files are being worked on today. The Changing Breeds Fiction Anthology in editing. – W20 Book of the Wyrm is in layout. This will be the next Kickstarter project if everything times out as expected. We think this book should appeal to W20 and W20 Changing Breeds fans alike. – Dark Ages: Darkening Sky (classic Dark Ages): PDF is available on DTRPG. Physical book PoD just needs to go on sale, hopefully this week. – Demon: The Descent: We delivered the Demon PDF to KS backers before the end of December, and the backer PDF has been updated and the PoD version is awaiting PoD approval (I sent for the PoD proofs). Now to create the traditional printing files. The Demon: Ready Made Characters set is in editing and the artist is working. Demon Seed Collection is in first drafts. DtD Seattle is in first draft. Heirs to Hell is in first draft. – Book of the Deceived (MtC): Redlines. The loss of a writer means their section has to be given to a new writer, CAS is on top of it. – nWoD: Dark Eras: Writers are following up on redlines except for one chapter which is having writer issues. Reason to Drink: Woot! Mage 20– it just doesn’t seem like 20(1) years since I stood next to Josh Timbrook as he finished each Tradition splat piece and I pasted them into the pages, while Chris McD kept the FedEx guy talking to stop him from leaving without the book files that needed to go that night to the printer. ◀ Deluxe Mage20 Kickstarter is live! The M20 KS makes me really sad that oWoD isn’t my thing, and that there probably won’t be an Awakening KS anytime soon. I’m also incredibly sad that all the companies that used to make hologram for comic book covers have apparently gone bankrupt. I did notice that M20 had joint tiers for the US and Canada this time around. Can you tell us more about how that will affect future KSes or KSes that haven’t shipped yet? I would be a very happy Canadian if it turns out I don’t have to deal with customs for the future Exalted KSes. I don’t mind paying the fees, but I’d like to avoid the hassle having to sort things out between myself, the concierge and the shipping company. It won’t help me with PoD orders, but I’ll take what I can get. Awakening doesn’t need a kickstarter – like Strix Chronicle, Fallen World will come out anyway. If you want the experience of a nWoD kickstarter to show your nMage love (which really marks you out as a person of good taste and discernment,) then Dark Eras is coming around in a few months. With M20, I knew for a fact as I was creating the KS that we are printing with a Canadian printer who could also then ship the Canadian backers’ packages. This is not always the case, and since we got burned on shipping last last time I put the US and Canada together, I’m ultra-careful. I’ll keep my fingers crossed for the future then. Thanks for the clarification. I’m so happy MAGE 20 is so incredibly successful. Congratulations to the whole team who put it together and made it possible. The tantalizing sneak peeks at the Art look beautiful. I can’t wait to see what’s happened to the Order of Hermes. I wonder if they only use Tablet mobile devices to study their grimoires now. I also can’t wait to see how the Sons of Ether differentiate themselves from the Technocracy. Finally, I’m so happy that Mage the AWAKENING is so unpopular. I hated that game with all my heart. Yeah; Awakening is so “unpopular” that it’s getting a new edition later this year (the “Fallen World Chronicle”). As a fan of both games, I mourn only the fact that there’s little chance of an update of the Mage Translation Guide to M20/FWC standards any time soon. I’m eagerly looking forward to M20, and then to FWC. And Ex3, and TC, and Sc2. Quinn, please refrain from those types of comments. You don’t need to denigrate fans of one game in order to like another. There are plenty of Awakening fans. There are plenty of people who are simultaneously fans of both Mage games. There are plenty of artists and authors who work on both. If you want to gush about Mage20, that’s awesome! But you don’t need to crap on Awakening to do so. I recommend you go back and read Rich’s post about proper behaviour. I can happily say I like both. It depends on my mood, honestly. And even if I liked one better, I’d never wish ill on the other. I mean, I like Changeling: The Lost better than Changeling: The Dreaming–by far–but I’d never go around mouthing off about it. I’d be really happy if a hypothetical Dreaming KS did well! Taking pleasure in the (imaginary) unpopularity of something other people love, when that thing causes no harm to oneself, is pretty much the ur-example of missing the lesson of “don’t crap all over stuff; it adds nothing to the conversation”. As the person who wrote the Awakening LARP rules, I can confirm that love for Awakening is alive and well. I’m super stoked about the upcoming Mummy releases. Do you think CAS could be persuaded to put some updates on the blog, maybe with some teasers, and perhaps let us know when the Scroll of Ages will go up? I know there are people that’ll work on it if he’s on lots of jobs. Please please please can we get some Mummy: The Curse previews? Everything has been rather quiet in Mummy land since Guildhalls. Please please please can we have some Mummy previews on the blog or CAS interaction on the message boards? Mummy has been very quiet since Guildhalls. The Scroll of Ages would also be fantastic. I’ll talk to CAS about getting some new info up, and popping into the forums more. Thank you! You have my undying (pun intended) gratitude. I know sometimes it might seem like the posters on the Mummy forum are ready to riot, but we’re all super, very grateful for CAS and his writers’ work. For my own account, I never meant any insult to anyone. I’m glad to see both WoDs up and running and maybe getting put back on the map, what with a con booth, too! This is a little off topic, but I’m not sure where to ask a “Classic World of Darkness” question so I’ll ask here. With all the 20th updates coming out and each one updating the other extras “tidbits” within their respective orbits where does that leave “World of Darkness” games themselves? Specifically I’m wondering about “Gypsies”. It is more than 20 years old now, but as just a “World of Darkness” book and not attached to any specific major game line I’m just wondering it, or any of the others of it’s kind will ever get an update. I guess if we wanted some crazy publicity, doing a 20th Anniversary Gypsies would make a lot of noise. I myself don’t have a rationale for doing a new version of it beyond that marketing hooplah, or for WoD: Mafia, for example of another one, but we might if there seemed to be interest. Never say never, but right now we’re plenty busy with the projects we’re already slated to do. “Crazy publicity” is one way of putting it…! How about a general CWoD 20 book for all the miscellany that has or is likely to slip through the cracks on the big X20 books? I for one hope Gypsies is one book that stays un-updated. The whole concept was so problematic and offensive. I do not think it can truly be done right. Redlines are where the developer looks through the first draft of a piece of work and ‘redlines’ the parts that may require amendment, removal or enhancement. It then goes back to the writer for final draft stage. Matthew has it right, and I’d also say that the Devs can redline the text at any point of the process before it goes to layout, depending on how they work with their writers. Jazzy Justin Achilli is known for first draft redlining so red the page looks like it’s bleeding, for example. Trying to see Justin as “Jazzy.” Brain kind of short-circuiting. Hmm. Book of the Wyrm KS!! Alright! The wait is almost over and I am exstatic! Bummer for M20, though, I really wanted to join in on this fun, but I can’t afford it right now. I’ll get it POD later. Sounds like you’re doig absolutely fantastic without me, so congratz on the team. It’s never as good without you, Y. Wait! That sounds creepy. Never mind. Hahaha! That’s fine, Richt. Creepy isn’t always bad. Creepy permeates both WODs after all. Sweeeettttt….Book of the Wyrm is next. I don’t suppose we know when Decent will actually be available for purchase on Drivethru? I’m trying to resist M20 only because my group is resisting me on playing WoD. I will crush them into it in time I hope….but one has already cracked and is leaning towards some M20. This is really sad that so long after the introduction of the Internet we are still figuring this out. All products will have detractors, but what I have seen come out of WW and now OP makes me think that there are people involved who really care about the product they are putting out. This is why I buy products that I may never get to use. Is the team having fun reading through what I am sure was an avalanche of submissions? I wanted to ask a few questions, and this looked like the place to try. Given the 20th anniversary editions such as V20 ghouls being worked on, M20 are other ‘generic’ CWoD books a possibility such as Blood Tides? I’m NOT making any attacks, mind you, but I understand how the long, long process of some of these projects can grind on us. I know in my heart and head that the end product shall be brilliant and oh-so-worth the wait, but it sometimes feels like we’re waiting through the entire Second Age for Exalted 3E to come, just as an example. I do feel some of that frustration, but that’s NO reason to attack or threaten anyone. I’m pleased with how well Rich and everyone at Onyx Path keeps us updated about what’s going on here, on the Facebook, on Kickstarter. Don’t let the haters get any one of you down. Onyx Path is doing super work, now and ever! I know, right? I keep meaning to tell my FLGS (such as it is — a comics shop and a quasi-headshop in my local mall) about the OP Kickstarters so they can get in on the retailer action, but even when I think about it, I’m worried they’ll be all peeved about the times I’ve forgotten, or just failed, to do so. Shifting the focus to VtM now, what can you guys say about Anarchs Unbound and Rites of Blood release date? Are the respective DrivethruRPG PDFs going out this month? Not to worry Phaolan. You only missed out on winning copies of the entire White Wolf back and future library with pages made of solid gold, words hand-chiseled by blind Tibetan monks. Nothing big!